Free Shipping Included! 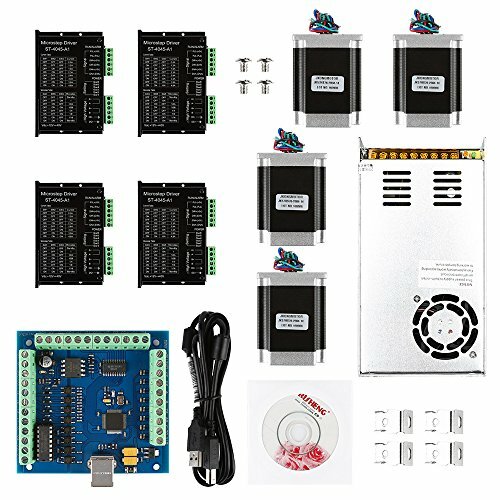 SainSmart CNC 4-Axis Kit with ST-4045 Motor Driver, USB Controller Card, Nema23 Stepper Motor and 24V Power Supply (CNC Kit 6) by SainSmart at N Online Agency. MPN: 16050. Hurry! Limited time offer. Offer valid only while supplies last. Description: This is SainSmart new CNC complete kit for engraving DIY. It comes with necessary and basic parts to make your own engraving machine. Support MACH3 and other computer software; with USB interface, easy to use and set up. This can control up to five stepper motor driver. It is easy to tell the input status with LEDs. It needs to use external 24V DC power supply to isolate USB and external port, and to make the system more stable. ● Power Supply: with built-in cooling fan, this also comes with short circuit, overload, over voltage, over temperature protection. 57HS76 stepper motor, powerful and stable to work. Easy to assemle, simply to DIY.